In today's information age, infographics have become a popular way to communicate complex ideas and make large quantities of data understandable. Creating infographics in the classroom is a great way to get students practicing and using digital-age communication skills. Students can combine Wixie's paint and imaging tools with text labels and call outs to organize and share the information they are learning in the classroom. Students who haven’t worked to represent information visually, need to grow their skills before they are ready to create stunning infographics with large amounts of data and information. Here are some ways you can help your students grow these skills. 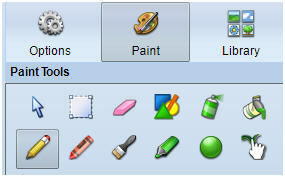 Click the Paint button in Wixie for access to a suite of paint tools and options. Add text labels with the Text tool on the toolbar. Infographics are designed to make large quantities of data easier to understand. Their counterparts, infoposters, are designed to quickly and effectively share information and ideas. Students can easily use a combination of original artwork, images from the media library or an online search, and then add text labels and descriptions. Infoposters are a great performance task you can use to evaluate student understanding. If students are new to this task, ask them to share a single piece of information, such as one part of a process. Click the Library button in Wixie to find and add images to help visualize information. 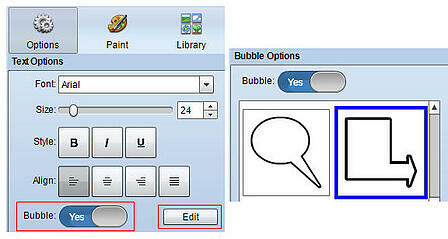 Students can use text options in Wixie to change text to a speech bubble to create visual flowcharts. As students build their digital-age communication skills, ask them to visualize an entire process or share a more complex set of information. Students want to do real work in the classroom, not simply academic exercises. Infographics that are statements of priority and action a great way to motivate students and ask them to apply communication skills to raise awareness and change minds. 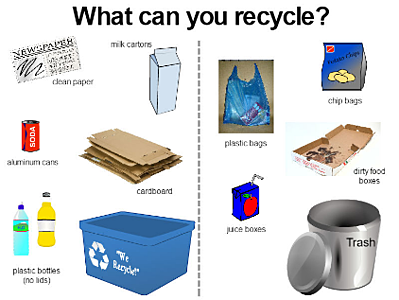 As you can see from this What can you recycle? poster, the data doesn't have to be difficult, and the infographic doesn't have to be complex to be effective. As students grow in their visual communication skills, move them closer to working with larger amounts of data to visualize in their infographic. 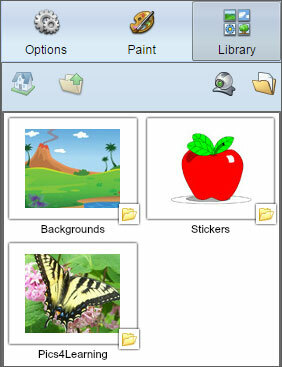 Wixie's media library includes a folder of images designed for data display. Click the Library button and open the Stickers library. Then, open the Symbols and Icons folder and open the Infographics folder to find images designed for data display. The more you can connect student work to real tasks, like raising awareness, the more motivated students will be. Ask students to create an infographic about a favorite activity or issue. From camping to health, to social media and conservation, infographics are a fun way for students to share their passions. There are lots of ways to take advantage of this exciting digital-age communication medium. Creating infographics with Wixie is not only motivating for students, but engages them in building powerful digital-age communications skills that empower them to share learning and change minds. Want a little more support to get started? Explore a complete Creating Infographics lesson plan from Creative Educator!